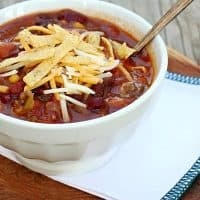 I’ve tried a lot of taco soup recipes and this one is the best. It’s really fast and easy to put together. Besides browning the ground beef, there isn’t much more involved than opening some cans, so it’s a great way to use up your pantry staples. This is the kind of recipe I like to throw in the slow cooker on busy days when I know there won’t be much time for making (or eating) dinner. You can use canned corn, but generally speaking I don’t enjoy canned vegetables, so I prefer frozen. Black beans are also a nice addition. The recipe makes a lot more than my family can eat, but the leftovers freeze well. In a large pot, brown ground beef, garlic and onion. Add to slow cooker, along with remaining ingredients. Cover and cook on low for 4-6 hours. Serve with taco toppings, such as sour cream, shredded cheese, sliced green onion, olives and crushed tortilla chips. 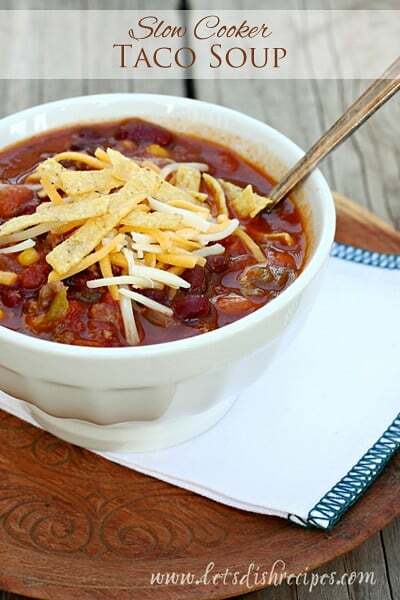 Who Dished It Up First: I’ve tried a lot of taco soup recipes I didn’t care for, so I decided to come up with my own. I got the idea for adding a package of ranch dressing mix from Paula Dean. Wow this taco soup looks great. I have never commented about this particular soup but I have made it about ten times since you posted. I love it. I really like the ranch added to it, just a nice little kick. Love it. Just wanted to let you know. I think this is what we are having for dinner tonight. By the way, I come here for my dinner ideas. Nothings on the menu, it’s 12:30, not really feelin a grocery run in my future… so I check here. Thanks!